This evening, I gave away the last of the Christmas gifts that I made. I have not posted a pic of these creations yet, however, I was really pleased with how they turned out! I love making my own skin products. I’ve enjoyed playing around with the recipe for this serum and have loved using it on my own face for the past year and a half. I gifted the guys and gals in my family with little containers of skin serum, adjusting the ingredients slightly for the men. For the ladies, I included lavender oil with a mixture that consisted of coconut oil, calendula oil and vitamin E. For the men, I added rosemary oil instead of lavender. 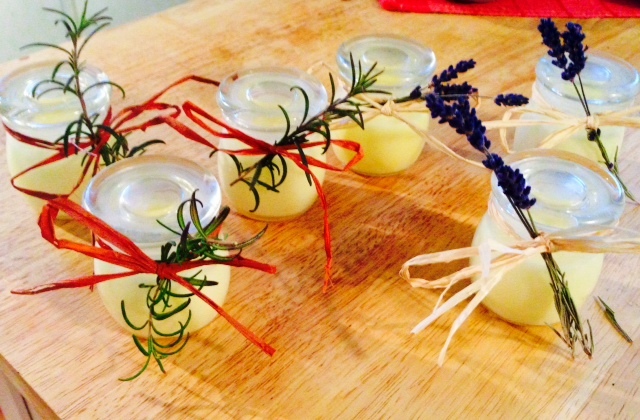 From my apothecary garden I added sprigs of dried lavender and dried rosemary, tying the fragrant herbs to the small glass jars with craft raffia. Cute, practical, and made with love. Interestingly, today I also removed the last of my Christmas decorations. While it is true I have had a lot going on, I don’t think I’ve ever been this slow to pack up Christmas. I adopted a more casual decorating style last December, letting the process evolve slowly and incorporating more of my everyday items into the Christmas décor. Perhaps that thoughtful, slow decorating flowed into the undecorating process. Perhaps I was just busy and too tired in the evenings to bother with it! Whatever the reason, I now have empty spaces in my house, and I am finding that I am not in a hurry to fill those spaces with the décor and knick knacks that occupied the table tops and containers before Christmas. 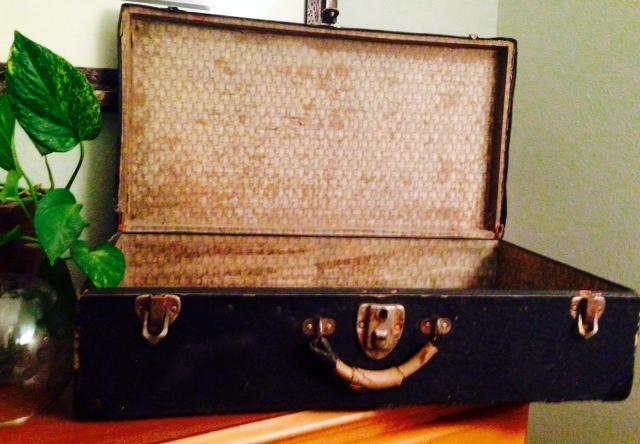 So the vintage suitcase sits empty for the moment, while I wait to see what I am inspired to create within its depths. The front porch awaits my muse. I am fascinated to see what happens! This phenomenon is actually a mirror of what’s going on in my life, so I am intrigued by the parallels. I have a strong desire to streamline my surroundings and my life, uncluttering them, and literally, make room for the new that is showing up….the fresh ideas, the new opportunities, the shifts in all areas of my life. As I “undecorate” my life, packing away the glittery shiny things that have been the external representations of who I am, I am creating a quiet space that I am in no hurry to fill. The flow of Life will take me where I need to go, bring those I am to journey with to me, open the right doors at the right time. It feels natural and very freeing, and that clearing of energy and space opens up the area around my heart, allowing love and light to move unhindered through me. As with the decorating of my home, I am fascinated as well to see what flows into my life and what I am inspired to create! I love this gentle time of growing and opening and being. I did hang one framed quote on my front porch, above the empty-for-now table. 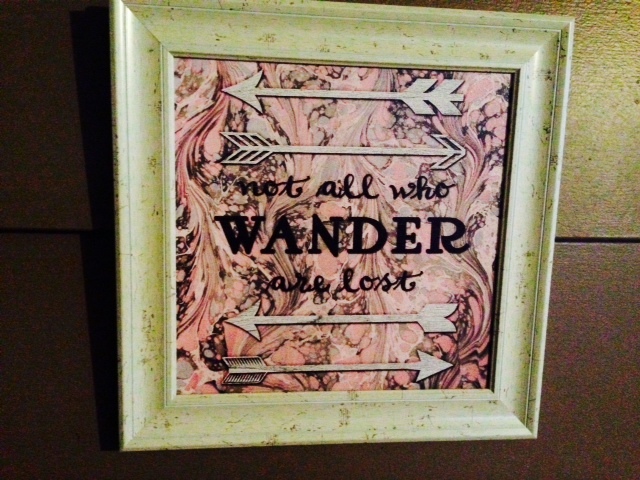 I saw it today at Hobby Lobby and knew it was ideal for my year of journeys. It is a Tolkien quote which made it perfectly suited to me. “Not all who wander are lost.” I am not lost at all. I am on a journey without a set destination in mind, open to everything, attached to nothing, a sojourner just passing through. I am enjoying how far I can travel in a day and the joy is, truly, in the journey.